FOXBORO, Mass. – There are a lot of new faces on Foxboro this season and players jumping into bigger roles for the defending Div. 2 state champions, but some things haven’t changed for the Warriors. The game is still played at a fast pace, the defense is still aggressive, and Foxboro continues to win Davenport games. 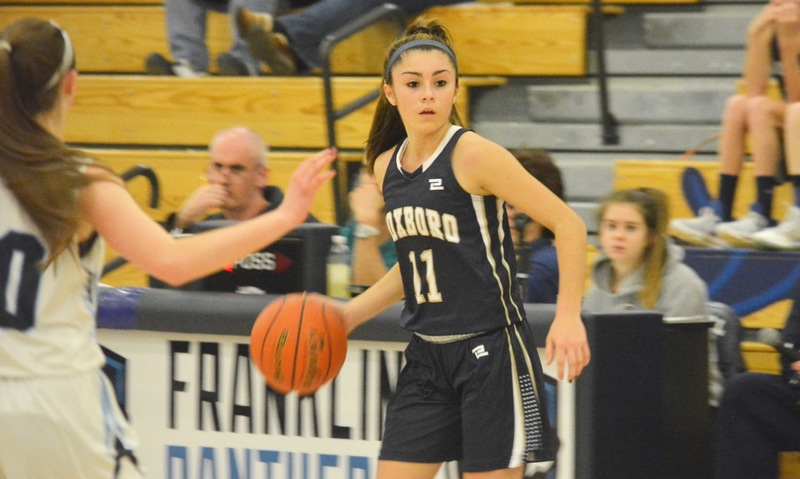 One of the returning starters is sophomore Katelyn Mollica and on Friday night, even with Canton senior Maggie Connolly (seven steals) hounding her for three quarters, she dominated. 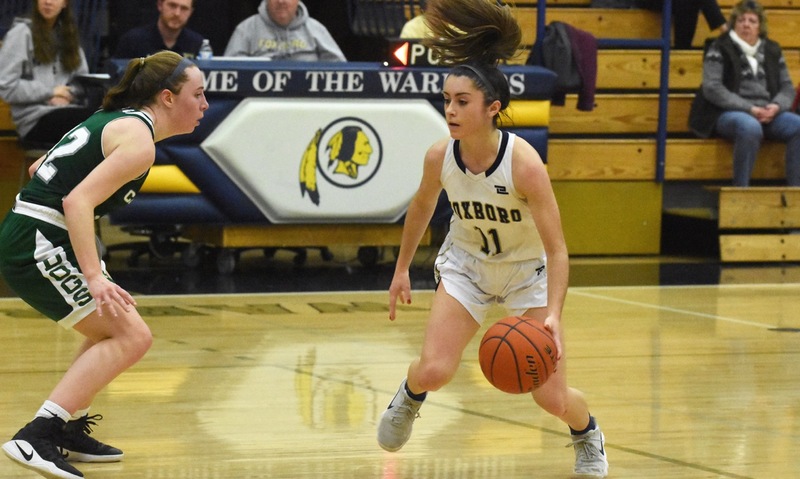 Mollica scored a career-high 31 points, including 17 in the third quarter alone to lift the Warriors to a 86-61 win in an early season divisional clash. Connolly was also the star on offense for the Bulldogs, scoring a career-high 22 points in the loss, but this game was a learning experience for Canton’s talented underclassmen. Foxboro jumped out to its speed right from the opening tip, taking a 10-2 lead in the opening minutes and with four different players getting on the board. Canton tried to get back into by forcing turnovers, with Connolly getting out on the break and finishing a pair of three-point plays on her way to a 12-point first quarter. The Warriors just kept scoring, with Chelsea Gibbons (13 points) putting in five in the first and Mollica adding six, but the Bulldogs closed the quarter on a 7-0 run to cut the lead to just 20-16. On the first play of the second, Julia Hamilton lobbed a pass into Erin Devine for an easy layup that made it a two-point game. It would be as close as the Bulldogs would get for the rest of the night, as Foxboro outscored Canton 24-11 in the second to take control of the game. Mollica added eight in the quarter, including six from the free throw line, and Abby Hassman (the other returning starter from the state title game) scored six of her eight mostly driving the ball to the basket. Junior Lizzy Davis and sophomore Adrienne Dunn each added a three top open up a 17-point lead at the break. One area that Foxboro dominated was on the glass. Hassman (10 rebounds) and junior Yara Fawaz (seven boards) led the way for the Warriors, using their athleticism and quickness to control the paint. Canton also battled foul trouble for much of the first half, forcing a lot of subbing and rotating the lineup. Mollica took over in the third. After back-to-back baskets by Gibbons extended the lead to 22 points, Mollica stepped back for a three-pointer, then hit a pull-up jumper in transition, and scored again on the break to push the advantage to 59-30. Freshmen Sydney Gallery (nine points) and Kiara Cerruti (10 points) scored buckets for the Bulldogs, but then Mollica drilled a pair of threes to avoid any slip in the momentum. In the fourth, Canton tried to claw back with Connolly adding six more points and the talented group of freshmen starting to find their footing. Syndey Gallery scored six in the quarter, while her sister Fay added five of her nine points and Cerruti scored four. It wasn’t enough to get Canton back in the game but it was a positive way to finish the night. Foxboro (2-0) will try to stay unbeaten when it travels to Taunton on Wednesday night. Canton (1-1) will look to bounce back with a tough trip to unbeaten Franklin.